-- Bono, U2, "Where the Streets have no Name"
Christ teaches that God is love. What does that mean? What it means for me: a study of the life of Christ. Love here describes itself as a child born in straw poverty, the most vulnerable situation of all, without honor. I don't let my religious world get too complicated. I just kind of go: Well, I think I know what God is. God is love, and as much as I respond [sighs] in allowing myself to be transformed by that love and acting in that love, that's my religion. Where things get complicated for me, is when I try to live this love. But his Christianity is not only reflected in his work with the poor, but has been reflected throughout his life in the lyrics of his songs. The first big U2 hit was "I Will Follow" -- a phrase that doesn't need much elaboration for a Christian. While the song is primarily about the relationship between a mother and son, it contains allusions to following God as well when Bono laments, "I was blind, I could not see" (a reference to John 9:25), and later rejoices, "I was lost, I am found" (a reference to Luke 15). A second level was suggested by Bono himself who described the song as being suggested by the social standing in Belfast -- a place that was so segregated between Roman Catholics and Protestants and rich and poor at the time that you were able to tell a person's religious views and income simply by what street upon which they lived. 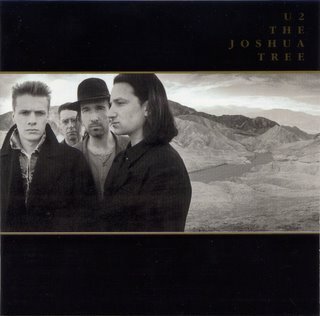 Bono's desire to end the bloodshed in his beloved Ireland (as also reflected in the earlier U2 anthem "Sunday, Bloody Sunday") is shown in this dream of a place where the streets have no name, i.e., they are places where all people live without the walls that otherwise divide us. Couple this experience with the visit to Africa, and the song takes on a deeper meaning. The city's aflood and our love turns to rust. We're beaten and blown by the wind; trampled in dust. Again, I am not denying the more obvious reference to the dusty nameless streets of the tent cities of Africa, but just as there exists a deeper allusion to Belfast, so there exists a still deeper reference to heaven. The first two lines are references to the inability of man to make the world a perfect place. Looking at the poverty, he notes that our love (mankind's love for its fellow man) cannot cope with the scale of the poverty. The city is aflood, i.e., buried, in poverty, and our love is not big enough to cope with it and is, in fact, overwhelmed in the same way the metal turns to rust in the presence of too much salt water. Humanity is at the mercy of the world, and despite all we do we are "trampled in dust." (compare, Ecc 3:20 --"All go unto one place; all are of the dust, and all turn to dust again"). Yet, despite our own inability to love our fellow man enough to bring the destitute out of poverty, there is a better world coming. It is a place high on a desert plain where the streets have no name. The heavenly city is often portrayed as being "up high" in its descriptions as the city on the hill or as Mount Zion (Isa 24:23). The streets have no name which refers, in part, to the fact that those who are saved will be able to sit down with the greats of the faith as one people, with no separation between us (See, e.g., Matt. 8:11, where Jesus says that "many shall come from the east and west, and shall sit down with Abraham, and Isaac, and Jacob, in the kingdom of heaven"), which hearkens back to the earlier reference about "tearing down walls" that "hold me inside." In the Popmart Tour the song ends with then there will be no toil or sorrow, then there will be no time of pain, then there will be no time. This is a clear reference to heaven - no work, no tears, timeless. Revelation 21:4 He will wipe every tear from their eyes. There will be no more death or mourning or crying or pain, for the old order of things has passed away. I love the idea that God says: Look, you cretins, there are certain results to the way we are, to selfishness, and there's a mortality as part of your very sinful nature, and, let's face it, you're not living a very good life, are you? There are consequences to actions. The point of the death of Christ is that Christ took on the sins of the world, so that what we put out did not come back to us, and that our sinful nature does not reap the obvious death. That's the point. It should keep us humbled. It's not our own good works that get us through the gates of heaven. I never thought I'd say this to a rock and roll frontman, but "Amen." BK, this is possibly my alltime favorite song. I did not know about the allusions to Africa or Ireland, or about anything that Bono had said about the song. I just always felt that it was a mystical song about a higher realm, if not necessarily the Christian realm of heaven; I could not be sure that Bono wanted to get that idea across specifically. But he did. It's a wonderful mystical song; and I'm glad to hear it seems to say some specific things about the world. Thanks for the post. where have I been all week? Some great posts here! Where the Strrets Have No Name is one of my favourites. I never got the African connection with it - always took it as looking forward to the net life and wanting shelter here - heaven on earth to a degree. I think their best album is War - definitely. Kevin -- thanks for the kind words. I found the African tent city and Belfast allusions to give depth and meaning to the song that I hadn't known was there. Catez -- You need to come by more often. :D And I agree that War is their best album (although Rattle and Hum, Boy and the Joshua Tree are all close behind). I was only observing that the actual quote itself given by Jonas was incorrect: the line is "then there will be no time for sorrow."